A very attractive, dwarf, bulbous Ledebouria species, with dark purplish green, glossy leaves, which are pitted on the upper surface. This species is popular with collectors and growers of bulbous plants, but is facing possible extinction as a result of habitat degradation. Solitary to gregarious, deciduous, bulbous plant, forming small clusters. Bulbs small and whitish in colour. Usually producing 3 or 4, somewhat succulent leaves in summer, simultaneously with or before the flowers, lanceolate to broadly triangular, dark purplish green, appressed to the soil and adorned with pits on the upper surface, lower surface plain green or green suffused with purple. Inflorescences usually between 1 and 3, are produced in early spring into summer (October to November). 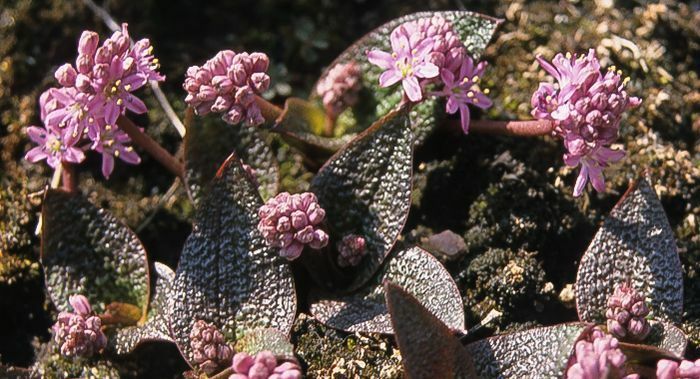 The decumbent inflorescences hang outward and turn upward towards the apex, which bears multiple, pink to lilac flowers. Each individual floret is attached to the peduncle by a slender, purplish green pedicel (flower stalk). The individual florets are comprised of 6, recurved, pink to lilac tepals (petals). Stamens lilac, extending beyond the tepals, bearing small, pale yellow anthers at their tips. Ledebouria galpinii is assessed as Endangered (EN) in the Red List of South African plants, because of habitat loss and degradation. Invasive kikuyu grass is invading and smothering the plants feral horses are trampling the plants, as well as spreading the kikuyu grass in their dung. Closer to human habitation, the spread of alien species results in shading of the plants and an alteration in the burning regime, which also adversely affects plants, because the sun-loving Ledebouria galpinii is being smothered under layers of moribund (dead) vegetation. The Kaapsche-Hoop African hyacinth is endemic (found nowhere else in the world) to the area around the mountain village of Kaapsche-Hoop in Mpumalanga, South Africa. It occurs in shallow, sandy soil pans and sparse, short grassland and pockets created by the unique geological formation of Black-reef quartzite, at the specific locality. 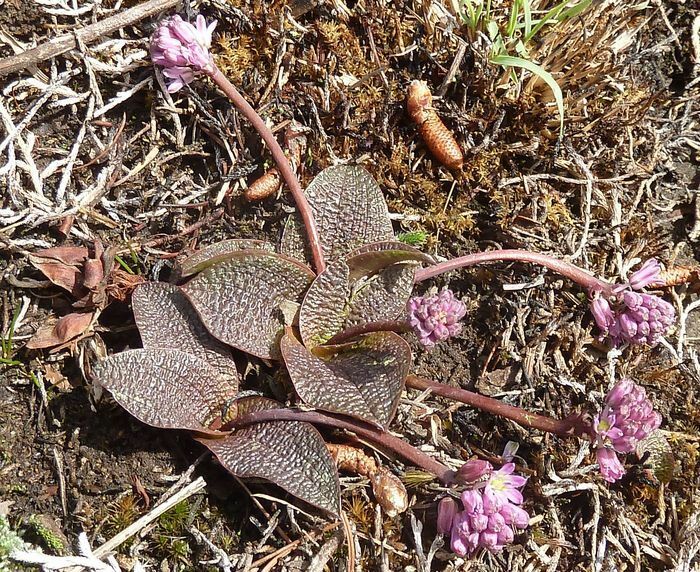 This species was first named as Scilla galpinii in 1896. It was subsequently included into the broader concept of Ledebouria cooperi by J.P. Jessop during his taxonomic studies on the genus, in 1970. Only as recently as 2003 did the species again get formerly recognized as a stand-alone species of Ledebouria by S. Venter & T.J. Edwards, in their studies on the genus. The genus Ledebouria is named in honour of the German-Estonian botanist Professor Carl Friedrich von Ledebour (1785–1851). The specific name galpinii honours Ernest Edward Galpin (1858–1941), a South African botanist and banker who collected plants extensively in the region, and consequently had numerous plants and a genus named after him. South Africa has 39 Ledebouria species (in Section Ledebouria); however when considered together with Section Drimiopsis and Section Resnova there are 59 Ledebouria species in South Africa. The genus is distributed across Africa, India and Madagascar, with the centre of species diversity in the eastern parts of southern Africa. Ledebouria galpinii cannot be easily confused with any other species of Ledebouria in the region, because of the usually characteristically glossy, purplish-green, pitted leaves. 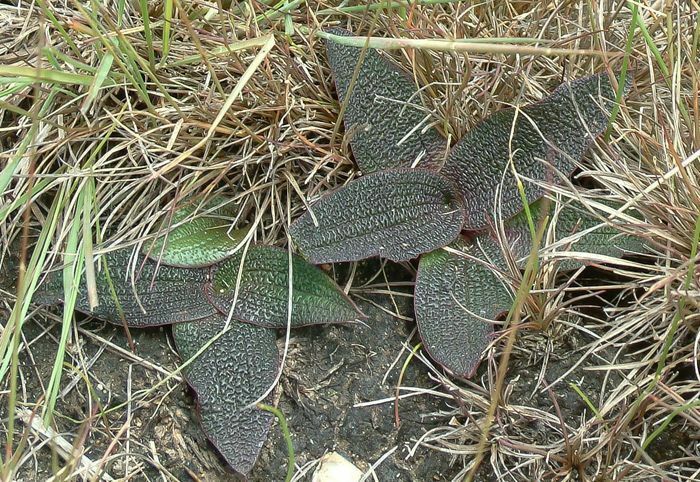 The only other species which has pitted leaf surfaces, is L. mokobulanensis, which has usually solitary round leaves, plain green in colour and pitted with red pits. There is little documented information about the ecology of this species. 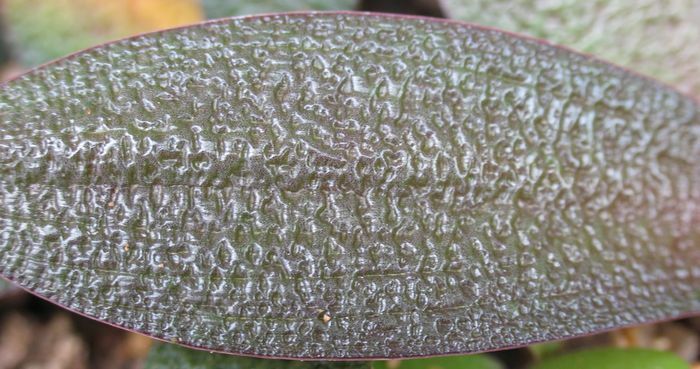 The pitted leaf surface may be related to discouraging insects from settling to feed on the leaves, as they look as if they have already been eaten with their pitted appearance. The purple-green colouration of the leaves may have something to do with masking the plants to look similar to Cyanotis lapidosa, an unrelated plant that also has purple green leaves,,which shares its habitat and co-occurs with this species. Porcupines are known to dig out and eat the bulbs of several Ledebouria species. The prolific production of seed and ease of germination, ensures that the species spreads effectively around its habitat. The flowers are open and cup-shaped with their pollen openly presented, which suggests that the flowers are opportunistically pollinated by most visiting insects. In the wild many different insects can be seen visiting the flowers, which are not recorded as being scented, mostly by bees, including honey bees. S. Venter (1993) suggests that the small, black and roundish, Ledebouria seeds may be distributed by water wash, which is likely after heavy thunderstorms, which are frequent across the areas where this species occurs. 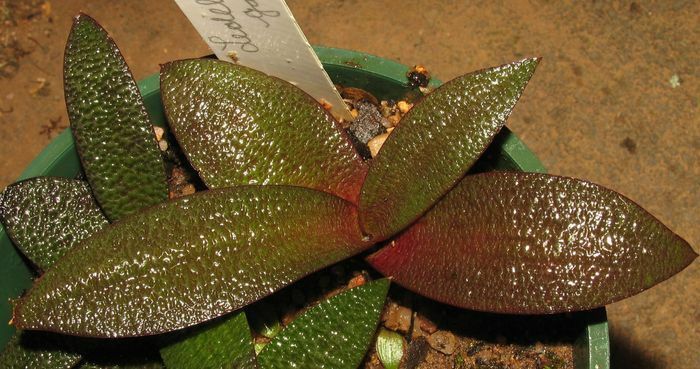 There are no specific references in the literature indicating that Ledebouria galpinii has any uses by humans, apart from it being a popular pot plant, especially amongst collectors and bulb enthusiasts. The genus Ledebouria has been cited as having been used medicinally for various purposes, including pregnancy, diarrhoea, influenza, backache, skin irritations, wound treatment, as well as lumbago. The genus is also reported as being poisonous, although it is also reported that Bushmen eat the bulbs of certain species (L. apertiflora and L. revoluta). However, these may have been cooked or prepared in some manner to destroy the toxins, which is not specifically documented. Ledebouria galpinii is very easy to maintain in cultivation. The species is best suited to containers in full sun or well-lit dappled shade, in a cool climate. The bulbs should be planted in a very sandy, mineral soil, with small amounts of sifted kraal (cattle) manure, well-aged compost and some peat added. Watering should be generous in the summer growing period, and is best completely withheld in the dry winter dormancy. In their natural habitat, the species would receive abundant moisture from soaking rain and condensation from frequent mist. They prefer a cool climate where summer temperatures seldom go above 25ºC, and can withstand very cold temperatures in winter when the soil is usually almost completely dry and the plants are dormant. During the dry winter dormancy period, the pots should be moved out of the rain and placed in a dry, cool area with good air movement. Watering can commence at the onset of warmer weather (August to September). Propagation from seed is the best method of producing new plants. Seed must be sown fresh (cannot be stored), in spring or summer in seed trays or pots filled with the sifted potting mixture detailed above. The seed can be sown on a firmly tamped surface and lightly covered with the same mixture, approximately 2 mm deep. The seed trays should be kept in a bright position out of direct sunlight and kept damp for between 2 to 3 weeks, until germination has commenced. The seedlings can remain in the seedling tray for many years because of their small adult size, or be planted out at the beginning of their second or third growing season. Flowering size bulbs can be attained after 1 or 2 years. Unusual for the genus, this species can also be propagated from leaf cuttings taken in the summer months. Craib, C. & Hankey, A. 1998. Ledebouria galpinii, a Rare Mountain top Mist-belt Species. Herbertia 53: 54–58. Edwards, T.J. & Venter, S. 2003. A revision of Ledebouria (Hyacinthaceae) in South Africa. 3. The reinstatement of L. ensifolia, L. galpinii and L. sandersonii. Bothalia 33,1: 49–51. Hankey, A.J., Lötter, M., Burrows, J.E. & Von Staden, L. 2008. Ledebouria galpinii (Baker) S.Venter & T.J.Edwards. National Assessment: Red List of South African plants version 2017.1. Accessed on 2018/06/09.